1952 was an incredible year for television and competing in the realm of science fiction were not twp but three TV series of enormous interest and quality. Over on the DuMont Network Captain Video and his Space Rangers raged as over on CBS, Tom Corbett Space Cadet was a prototype "space" series, using lots of miniatures and effects. ABC showcased Space Patrol, lavished with a great cast, special effects and stories that really put much of our modern science fiction to shame especially in later episodes. 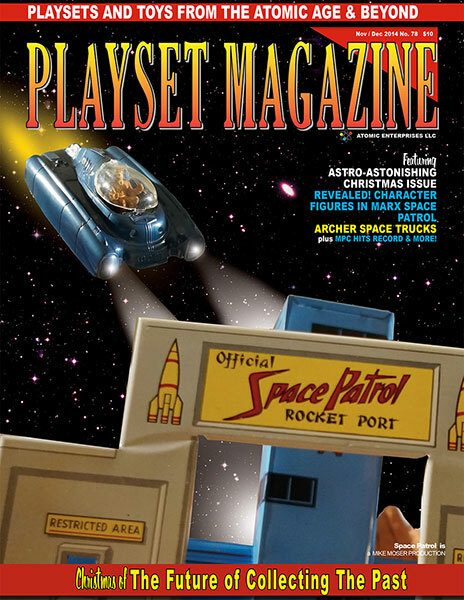 Equally fantastic, then, is Marx' "Official" Space Patrol playset, headwaters source for many figures and accessories used far into the future. The most amazing thing is how nimbly Marx intermixed figures and lithography from two of its top licensed properties, Tom Corbett and Space Patrol, allowing useful cross-pollination so that both shows could be marketed while still pleasing kid-aged cadet fans of both. The interstellar display this time is courtesy that master of terrain, Jim Clouse, and the mint set on the centerspread is courtesy Rick Eber's enviable personal collection. There were quite a few "grips and helpers" doing the display setup, too: Eric Koopmeiners, Craig Remington, Jim Clouse our Webmaster, Tom Lowzowski, and a few other spacemen including set meister Rick Eber and your humble editors. It was a blast.